Der Mars ist nach der Erde der meist erforschte Planet. Seit den 1960er Jahren starten Missionen. Aber alle kratzten bisher an der Oberfläche. 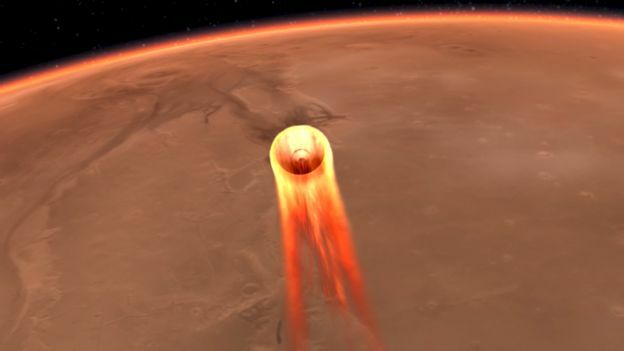 Nun soll die neue Marsmission InSight erstmals Einblicke in die Tiefen des Planeten geben. 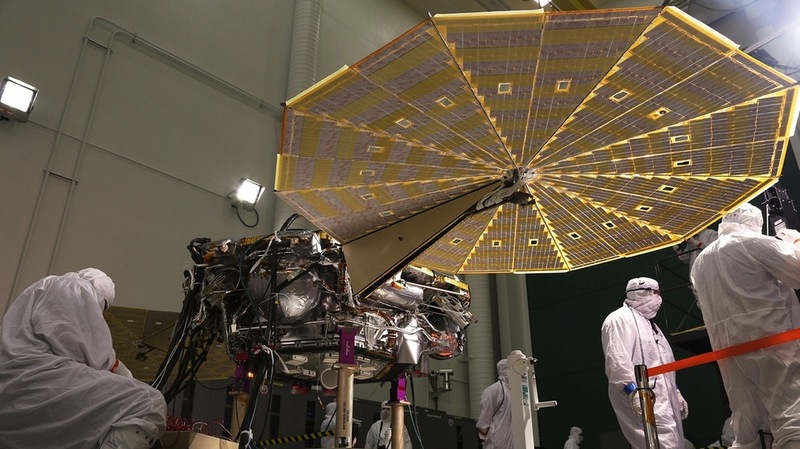 Mit dem Mars ganz nah dran: Der InSight-Lander der NASA zeigt an, dass sein Seismometer “geduckt” ist, um Geräusche zu hören. A new scan of an International Space Station module shows several hundred impact craters from „marauding“ debris, according to the European Space Agency. But so far, the hull of the European Columbus science laboratory is doing its job in protecting astronaut crews. Das russische Frachtraumschiff Progress MS-09 ist am Freitag um 17. 50 Uhr deutscher Zeit über dem Pazifik in den dichten Schichten der Atmosphäre verglüht. Es war rund vier Stunden zuvor von der Internationalen Raumstation ISS abgekoppelt worden, teilte die GK Roskosmos mit. International Space Station Configuration. Three spaceships are parked at the space station including the Northrop Grumman Cygnus resupply ship and Russia’s Progress 71 resupply ship and Soyuz MS-11 crew ship. A Russian cargo ship left the International Space Station this morning and was deorbited for a destructive demise over the Pacific Ocean. The Expedition 58 crew now turns its attention to the departure of a U.S. space freighter next month. Russia’s Progress 70 cargo craft undocks on time today from the Pirs Docking Compartment . A Russian Progress 70 (70P) cargo craft undocked from the International Space Station today at 7:55 a.m. EST loaded with trash and discarded gear. It will orbit Earth a few more hours before reentering the Earth’s atmosphere over the Pacific Ocean for a fiery but safe destruction. er Generaldirektor der Europäischen Weltraumorganisation ESA, Johann-Dietrich Wörner, schlägt den Franzosen Thomas Pesquet für einen zweiten Flug Ende 2020/Anfang 2021 zur Internationalen Raumstation ISS vor. Die formelle Entscheidung dazu würden die ESA-Mitgliedsländer zu gegebener Zeit treffen, twitterte Wörner. Heute führt uns der Copernicus Sentinel 2B-Satellit nach Saragossa, die in Aragonien im Nordosten Spaniens liegt und Hauptstadt der gleichnamigen Provinz ist. „Space is for everyone“ is a popular saying, but it rarely holds true — partly because space is expensive, and partly because certain countries have decades of a head start and established procedures to rely on. The dense atmosphere roiling on Saturn’s largest moon, Titan, may come from organic material baking in the moon’s interior. NASA’s New Horizons mission has shared its most detailed view yet of the Kuiper Belt object nicknamed Ultima Thule. It’s become nearly impossible to remember that just a few weeks ago the object was a fuzzy blur. NASA’s Curiosity rover has taken its last selfie on Vera Rubin Ridge and descended toward a clay region of Mount Sharp. The twisting ridge on Mars has been the rover’s home for more than a year, providing scientists with new samples — and new questions — to puzzle over. We all edit our selfies to capture our best side, and the Curiosity rover on Mars is no different, as shown in a new „selfie“ NASA released to mark the rover’s last days at Vera Rubin Ridge. Vor ein paar Jahren kam der Spielfilm Pixels in die Kinos. Im Mittelpunkt des Films standen dabei klassische alte Videospiele wie Pac Man und Donkey Kong. Diese Spiele sind bekannt für ihr altes, pixeliges „Retro“-Aussehen, das durch eine geringe Anzahl von Pixeln verursacht wird. A new study using Chandra, XMM-Newton and Sloan Digital Sky Survey (SDSS) data suggests that dark energy may have varied over cosmic time. Der 1,5 Tonnen schwere Prototyp wurde im 3D-Druckverfahren aus künstlichem Mondstaub hergestellt. Before their fiery demise, NASA’s twin GRAIL spacecraft mapped the moon in a quest to learn more about our closest neighbor. The first privately-developed lunar spacecraft has arrived in Florida in preparation for its launch next month. SpaceX has fired up the rocket that will launch its first Dragon spacecraft built for astronauts ahead of an uncrewed test flight next month. In der Fregat-Oberstufe einer russischen Sojus-ST-Trägerrakete in Kourou (Französisch-Guyana) ist offenbar ein Problem aufgetreten. The European Space Agency ESA and ArianeGroup, as prime contractor of a consortium of Arianegroup, Space Application Services and PTScientists, have signed a contract to study and prepare ESA’s planned ISRU mission. In space, in-situ resource use (ISRU) is the practice of collecting, processing, storing and using materials found or produced on other celestial bodies (Moon, Mars, asteroids, etc.) to replace materials that would otherwise be brought from Earth. Auf der 11. Europäischen Weltraumkonferenz (European Space Policy Conference) haben Vertreter aus der Politik sowie von Raumfahrtagenturen, Industrie und Forschung am Dienstag und Mittwoch in Brüssel aktuelle Themen der Raumfahrt diskutiert. Suborbital spaceflight company Virgin Galactic laid off about 40 people earlier this month as part of a realignment of „skill sets“ in the company’s workforce as it prepares to shift into commercial operations later this year. Neurologist, astronaut, wildlife photographer, nonprofit founder, public speaker, inspirer of countless children for a generation — is there anything that Roberta Bondar can’t do? Under Armour will design the gear worn by passengers and pilots on Virgin Galactic’s suborbital spaceflights, representatives of both companies announced today (Jan. 24). A chunk of material brought back from the moon by NASA astronauts in 1971 harbors a 4-billion-year-old piece of Earth that was blasted off our planet by a long-ago impact, a new study suggests. Lengthy space missions such as a journey to Mars may take a serious toll on astronauts‘ immune systems, a recent study suggests. Researchers analyzed blood samples from eight astronauts who served roughly six-month missions aboard the International Space Station. They found significant negative impacts on „natural killer“ (NK) cells, a class of white blood cell that knocks out cancer cells. Dieser Eintrag wurde unter Newsletter, Raumfahrt, Spacecraft Mission News veröffentlicht und mit Bennu, Mars, NASA, NASA InSight, Newsletter, Opportunity, Osiris-REx, Spacecraft Mission News verschlagwortet. Lesezeichen für Permalink hinzufügen.